Olga Bauer is a talented Washington, DC mixed media artist, specializing in abstract art. She is also a friend and a wonderful subject for portrait photography. Olga and I met a few years ago, when I photographed her and her family on a warm sunny day in May. We enjoyed that session so much that we decided to meet again in the fall and create a series of portraits of Olga alone. For this session, I chose a location along the Potomac River, just north and west of the city. Bordered by a broad walking trail cut through a deep dense forest, the location was perfect for the day. We met there on a bright cool morning in November. 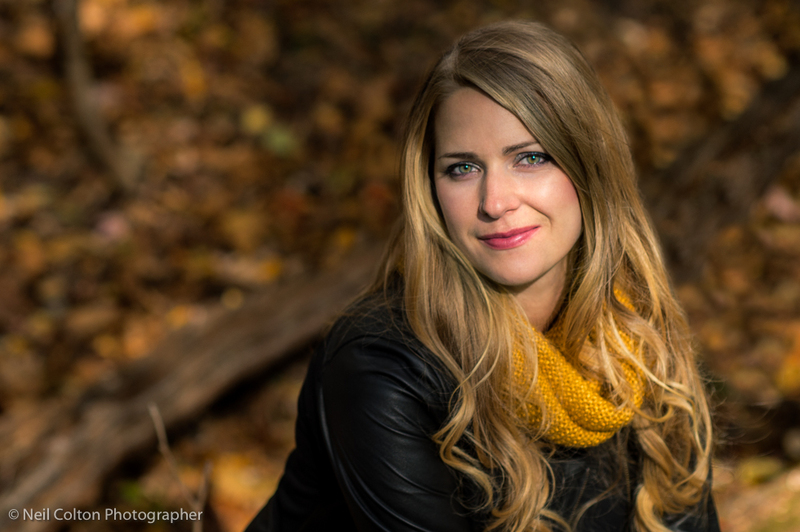 The fall colors were stunning and so was Olga, as we spent the next few hours searching for the best locations to create a series of portraits for Olga’s personal portfolio. Olga is not only a very talented artist, but she is also a wonderful model, with qualities of elegance, poise, beauty and patience that are admired and appreciated by this portrait photographer. Shooting in the studio allows control of every aspect of a portrait session. From the ambient temperature in the room to the color and quality of thelight, the photographer is in complete charge. No guesswork there. Move outdoors and that all changes, dramatically. Everything becomes a challenge and that continues through the session. From choosing the best loactions to managing pink cheeks to harnessing (or avoiding) the power and beauty of a brilliant sun, creating portraits on location requires a patient (and adventurous) model and an experienced photographer. On this day, Olga brought the patience and adventurous spirit and I brought the camera, along with a bit of experience. Many thanks to Olga for a wonderful session and to helping me create some great portraits of her!